Synergistic drug pairs combat multi-drug resistant bacteria. Antibiotics were the wonder drug of the 20th century, but persistent use and over-prescription have opened the door that has allowed bacteria to evolve resistance. According to the Centers for Disease Control and Prevention, more than two million people in the United States develop bacterial infections that are resistant to multiple antibiotics every year. 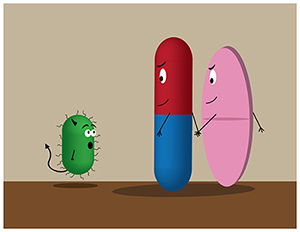 Previous research has shown that pairing antibiotics can be more effective than using single drugs, but finding these perfect matches has proven elusive. Researchers at University of Utah Health have developed a rapid screening method to identify beneficial pairs of existing FDA-approved drugs to combat multi-drug resistant (MDR) bacterial infections. The results are published online in PLoS Biology. “By pairing FDA-approved drugs synergistically, we have the potential to take these pairs to clinic much more quickly than new drugs, which can be expensive and time intensive to create and approve,” Jessica Brown, Ph.D., assistant professor in pathology at U of U Health. Brown and her team analyzed a bacterial dataset consisting of 4,000 E. coli mutants grown in the presence of 100 FDA-approved drugs. Each mutant is missing a specific gene and interacts with each drug in a specific way, producing a unique chemical genetic signature. Brown poured through the chemical genetic signature dataset to identify genes that could convey weakness in bacteria and offer new opportunities to pair different drugs to combat these difficult infections. A synergistic pairing is more powerful than just adding two drugs together. It amplifies each drug’s effectiveness by at least four-fold, according to Brown. The approach identified 14 drugs that could be paired synergistically. The most promising synergistic pairing in this study combined azidothymidine (AZT), one of the earliest drugs prescribed to treat HIV-AIDS, with floxuridine, a cancer drug with a similar chemical genetic signature as a commonly prescribed antibiotic — trimethoprim. Brown tested the effectiveness of the floxuridine and AZT pair by treating zebrafish infected with trimethoprim-resistant E. coli. The synergistic drug pair reduced the bacterial load by 10,000-fold compared to treating with the traditional antibiotic pair of trimethoprim and sulfamethizole. Brown explains the power behind this particular drug pair. AZT blocks DNA replication, while floxuridine, like the antibiotic trimethoprim, prevent bacteria from repairing their DNA. While many bacteria have developed resistance to trimethoprim, floxuridine remains effective, even against trimethoprim-resistant bacteria, because it works by another mechanism. Several of the drugs identified in this study are not currently used as antibiotics, but produce an effective response against MDR bacteria. “The reuse of FDA-approved drugs can speed up the regulatory process, because the drugs are already approved for use in humans,” said Brown. “This approach could open up new lines of research for future drug development that could enhance current antibiotic treatments,” continued Wambaugh. This approach is rapid. Brown believes it would only take a few months to screen a wider net of FDA-approved drugs for additional synergistic pairs. “Once we understand the mechanism of how each drug works, we can design new pairs to combat resistance,” said Brown. The synergistic drug pairing also has the potential to slow the evolution of resistance to the drug therapies, although this was not directly explored in this study. For the next step, Brown wants to collaborate with a clinician to take some of the identified drug pairs into clinical trials to examine their effectiveness at combating difficult bacterial infections in people. The research was supported by funding from the University of Utah. In addition to Brown and Wambaugh, co-authors include Viplendra Shakya, Adam Lewis and Matthew Mulvey from the Department of Pathology at the University of Utah.